Siloam Springs, Arkansas, is characterized by the supposed healing powers of the spring water feeding Sager Creek, which flows through the downtown area. Siloam Springs is known for its efforts to preserve and revitalize the city’s historic downtown and as a promoter of the arts via Sager Creek Arts Center. The Smithsonian magazine named this hometown one of the 20 best small towns in America in 2012. John Brown University, a private, interdenominational, Christian liberal arts college, is located in Siloam Springs. The community is located on the western edge of the growing Northwest Arkansas metropolitan area. This area of Arkansas is located where the southern plains meet the Ozark Mountains. The city sits on a plateau with many dogwood trees growing in the landscape. During the last weekend in April, Siloam Springs holds an annual Dogwood Festival, which is attended by some 30,000 people. 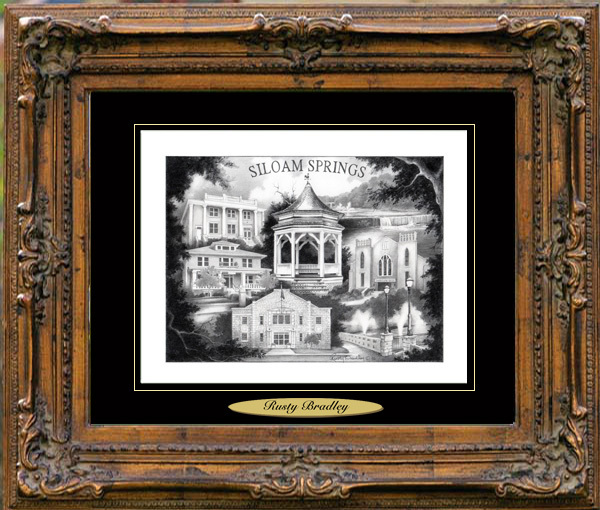 Don’t miss the opportunity to get your limited-edition signed and numbered print of Siloam Springs by Village Prints artist, Rusty Bradley.